We are in the process of migrating and updating our old site, so this is just preliminary information on this family of McCulloughs. Check back in a few weeks for more! Who was the first McCullough of our line in America? According to an article about the descendants of Sheridan McCullough, published in the Clarion Democrat, (Clarion, Pennsylvania, vol. LXXII, No. 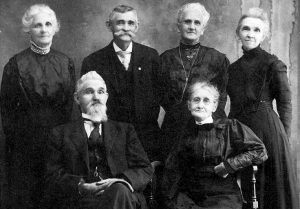 12, November 2, 1911), the first of our McCullough family in America was Hugh McCullough, who arrived around 1748. Although the Hugh tradition is fairly strong in various branches of the family who descend from Sheridan (probably based on this article), other information from the Hull family, as well as supporting documents found independently, strongly suggest that William McCullough’s father was James, not Hugh, and that the Mary McCullough mentioned in the Clarion article as a sister of William’s was in fact his daughter, perhaps by an unknown first wife. Please see Hugh or James? in the mystery section for more details. James had three sons: John, Jacob and William. William married Rachel Sheridine and probably had at least three children who lived to adulthood: James, Mary and Sheridan. Sheridan, was born in Baltimore in 1801, according to tradition, and some time before 1820, the family moved to Centre Co., PA. In 1825, Sheridan married Mary Ross, the daughter of Jonathan Ross and Mary McCalmont, both of whom died young. Mary McCalmont was descended from a long line of Scottish Covenanters, and this in itself is an interesting story that will be the subject of a future post. Sheridan and Mary’s first son William was born March 1, 1828, and sometime between 1829 and 1830, the family moved to Jefferson County, Pennsylvania. Sheridan had nine children of which eight lived to adulthood. Six of these are pictured above and in the article mentioned. 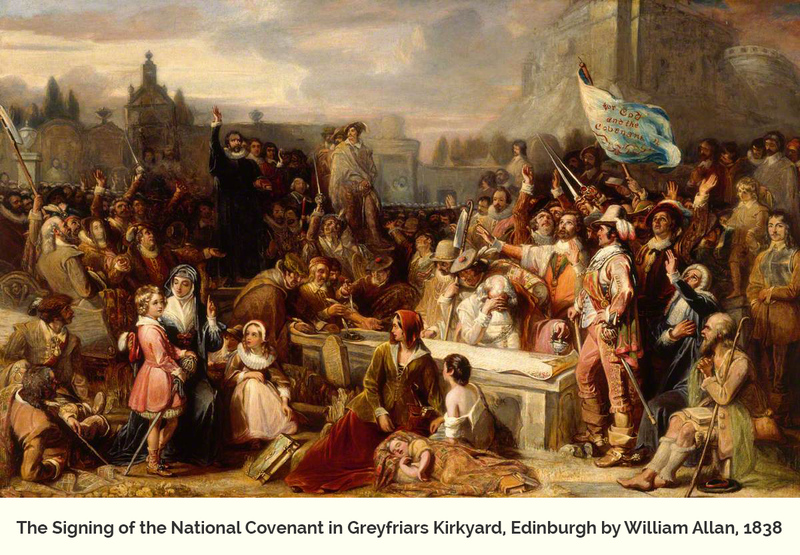 William is seated on the left. William McCullough married Elizabeth Jane Frampton December 28,1842. William and Elizabeth Jane were the parents of William Sheridan McCullough, born January 28,1863 and 12 other children. Elizabeth Frampton was a descendant of William Frampton, an early immigrant in the late 1600’s who served briefly in William Penn’s government. Most of Sheridan’s children spent their lives in or near Jefferson County, although one family moved to Michigan. Subsequent generations spread out more in western Pennsylvania and other states, the most common locations being Ohio, Michigan and later, California. We get many questions about McCulloughs in the southern US, but very few known descendants moved south, and a connection is unlikely. 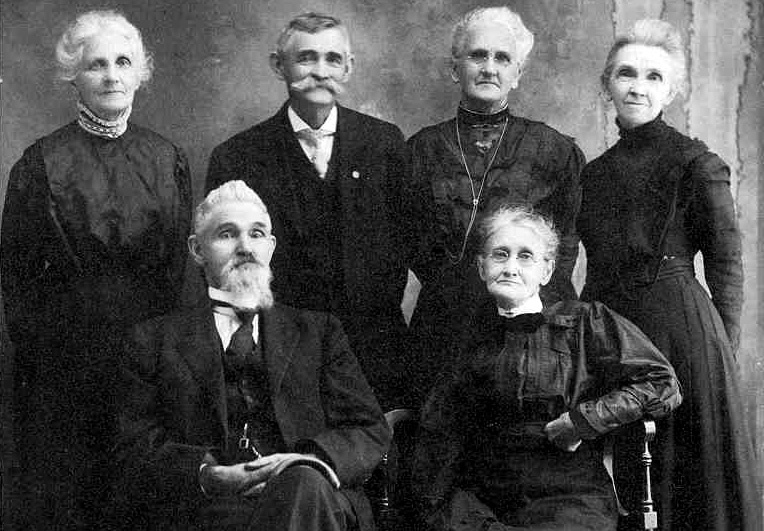 The Descendants of James McCullough, are pieced together from family papers, research books, internet research & information gathered from distant “cousins”. In the interest of making DNA matching possible with distant cousins, I have attempted to trance as many lines as possible to the present day. There is no information copied from internet trees, which are a great place to start research, but are notorious for their inaccuracy. Cases in point are the names Andrew Sheridan McCullough and William Richard, which seem to have been invented to fit someone’s unrelated line and have been copied many, many times. We have a Y-DNA test for our own branch of this family, but as far as we know, we are the only descendants of Sheridan who have done a Y-test. It would therefore be very useful if any other males of our line who still carry the McCullough surname to do this test. A good place to look for Y-tests is FTDNA (I have no connection with this company – it is just one of the very few offering Y-DNA tests instead of autosomal). They offer discounts on their tests several times a year, so timing is everything! Additional testers would help confirm the tentative conclusions and also localise where the family may have lived in Northern Ireland or Scotland, and so make it easier to trace the line back to Europe. If you are a McCullough cousin and need any help managing your kit and interpreting your results, I am happy to help. Please contact me. I don’t pretend all of my information is accurate. I do, however, attempt to do serious and well-sourced research, and hope to have the complete tree on-line soon. Despite best efforts, however, some information – and particularly birth dates that have been taken from census records – can vary by several years from one record to another. The trend is that our ancestors seemingly become younger as time passes. Some things never change! I welcome all additions and corrections, particularly on the earlier history in Maryland and links to Europe.